Penstemon is one of our more spectacular native plants. Found in mountainous areas and their foothills, the herbaceous species is a temperate zone darling and thrives in most areas of the western United States. Also called Beard Tongue, the plant produces dozens of tubular flowers arranged on a tall stalk. If you have gone hiking in areas of Mexico to western North America from May to August, you will have seen these attractive flowers. 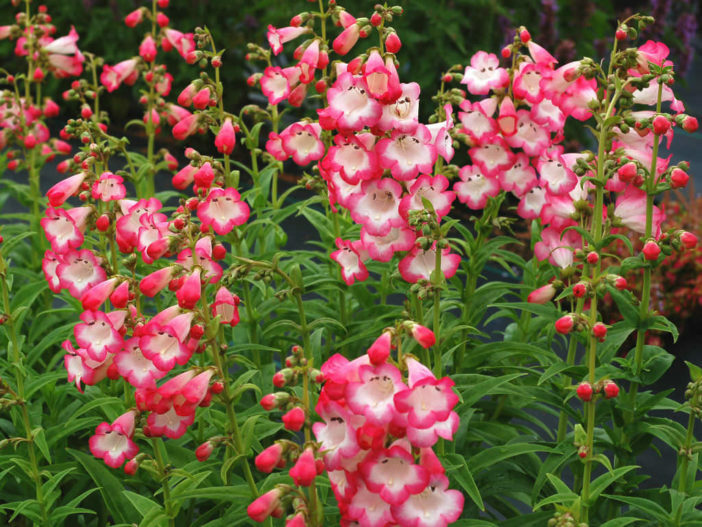 Penstemon plants are related to Snapdragons and come in a variety of cultivated hues for the home gardener. The flowers are perfectly shaped to accommodate hummingbirds, who spend their nesting period at the Penstemon snack bar. Each flower has five petals and they come in hues of lavender, salmon, pink, red and white. The stems are triangular and the leaves are arranged opposite with grayish green tones. Several different species exist and more are in cultivation. The exact shape of the leaves varies in each cultivar of Penstemon plants. They may be oval or sword shaped, smooth or waxy. Penstemon is a commonly found perennial, which may also grow as an annual in chilly or excessively hot regions. The best location for your Penstemon is in a full sun area with well draining soil. Penstemon care and maintenance is minimal if the site and moisture requirements are met. Poorly draining soils and freezing temperatures while the plant is still active are the biggest causes of plant mortality. You can grow Penstemon from seed. They begin as rosettes low to the ground before forming the characteristic flower stalk. Indoor sowing should begin in late winter. Seedlings are ready to transplant when they have a second set of true leaves. Space plants 1 to 3 feet apart and mix in a little compost at planting time to help conserve water and increase porosity. Water the young plants at least once per week as they establish. You can reduce watering as the plant matures. Mulch around the plants to help protect the roots from winter’s cold and prevents spring weeds. The flower spire will produce seed in late summer to early fall and the petals fall away from the seeds. Penstemon makes an excellent cut flower, which will last for at least a week. Go native and plant some Penstemon plants in your sunny perennial garden.